After 50 years old, women’s nutritional needs change. As menopause enters the game, the body starts producing and absorbing less of some nutrients, such as vitamin B12, and simultaneously needs a smaller amount of others, like iron for instance, with the stopping of menstruation. For that reason, many vitamin brands have developed specially formulated blends to suit women’s over 50s needs. Nature’s Way, the leading provider of herbal medicine and supplements in the USA, has brought one of its most popular formulas to the UK under their Alive! range: Ultra Women’s 50+ Wholefood Plus. All products have been specially formulated for the UK market to meet UK laws. The recipe is thus a bit different than the one found in the U.S. Alive! Ultra Women’s 50+ Wholefood Plus claims to help you make more out of life and feel more alive. But does it really deliver, or is it a marketing gimmick? While more research is needed, there is some evidence that vitamin C uptake declines with age. After examining various studies, the Linus Pauling Institute at Oregon State University suggests adults over 50 who are at higher risk for chronic diseases may benefit from increasing their daily vitamin C intake from 75mg to 400mg. This is largely explained by the fact that vitamin C can help protect the body from heart diseases, strokes, cataracts and even some forms of cancer. The amount contained in Nature’s Way Alive! Ultra Women’s 50+ Wholefood Plus is a good start but should be used alongside a healthy diet rich in fruit and vegetables. Vitamin D is created by the human body when it receives sunshine. Regardless of our age, we all need to supplement with vitamin D in the UK, especially during the winter months when the sun is weakest (or, as it too often feels, non-existent!). Vitamin D is particularly important for women over 50 for its ability to support the absorption of calcium, which in turn prevents the development of osteoporosis, a bone crumbling disease most common among older women. 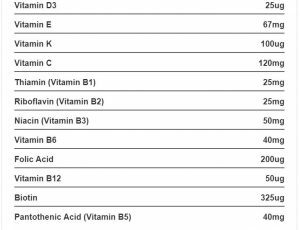 Note that the amount of vitamin D3 in Nature’s Way Alive! Ultra Women’s 50+ Wholefood Plus is higher than that recommended by the NHS, which recommends 10 µg per day for adults. Quite why Nature’s Way Alive! 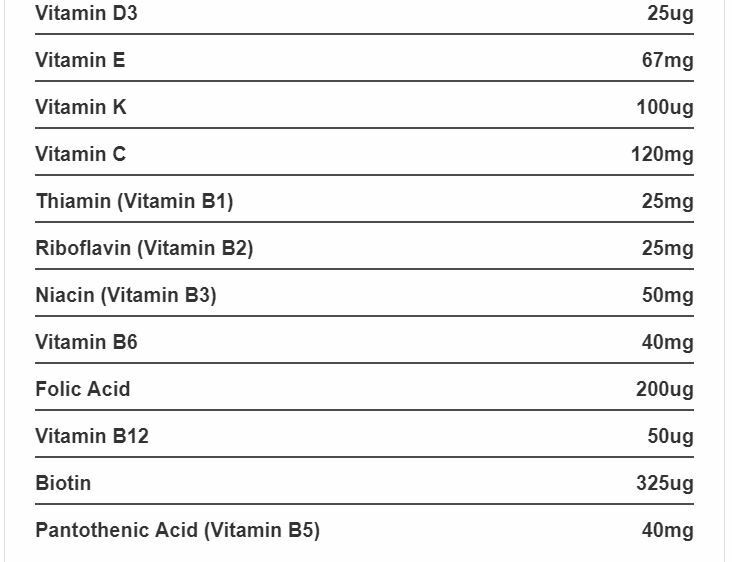 Ultra Women’s 50+ Wholefood Plus needs so much vitamin D3 is questionable, though there is some suggestion that higher concentrations could benefit optimum blood levels of vitamin D3. Regardless of the reason, be aware that this is significantly higher than UK recommendations, though any amount up to 100µg per day should be safe. Vitamin E is a powerful antioxidant and as such protects the body from cardiovascular diseases and the development of free radicals that may lead to cancer. In addition, it supports healthy hair and nails. In older women, vitamin E has proven to strengthen the immune system and prevent the development of Alzheimer’s disease. The levels of Vitamin E contained in this supplement are much higher than the dosage recommended by the NHS, which is 3mg per day for women. However, such an amount does not cause any harm to the body. Vitamin K is naturally produced by the body. It supports healthy blood clotting and the normal function of bones. Vitamin K intakes come from greens such as spinach, broccoli and cabbages, as well as vegetable oils such as canola and olive oil. Nature’s Way Alive! Ultra Women’s 50+ Wholefood Plus includes the full range of B vitamins. It is particularly important for women over 50 to supplement with B vitamins as they keep blood cells and the nervous system healthy, can prevent anaemia, boost metabolism and support the normal function of the immune system. Vitamin B8, also known as inositol, is a carbocyclic sugar that helps fight against depression, anxiety, insomnia and high cholesterol. It is naturally found in the brain. While too much inositol can cause side effects such as nausea, dizziness, headaches and stomach pains, the 10mg contained in one serving of this supplement is unlikely to cause any trouble. Vitamin B12 is particularly important as the older we get, the harder it is for us to absorb it from the food we eat but we can absorb it easier via supplements. Women over the age of 50, therefore, should always make sure they take a supplement containing vitamin B12. Nature’s Way Alive! Ultra Women’s 50+ Wholefood Plus includes a whopping 50µg of vitamin B12. The UK recommends supplementation of 1.5µg daily, while the U.S recommends 2.4µg and Europe 4µg. So, again a massive dose. That said, there is no set upper tolerable limit for B12 so as long as you’re not taking more than 2mg a day, it should be safe. Make sure not to take another supplement containing vitamin B12 as well as this one, however. The above nutrients are particularly important for women over 50 for helping to preserve and protect bone health. Both are included in Nature’s Way Alive! 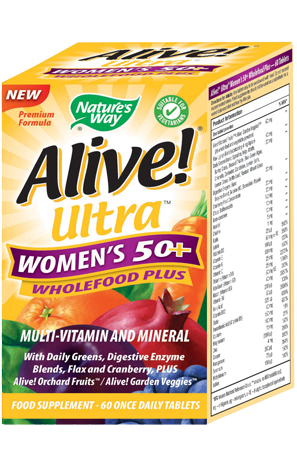 Ultra Women’s 50+ Wholefood Plus, though in smaller doses than the daily recommended limit. This supplement contains 100mg of magnesium and 150mg of calcium, compared to the recommended daily limits of 270mg of magnesium and 1200mg of calcium respectively. We can’t criticise this, however, as it’s a common theme throughout women’s multivitamins – both magnesium and calcium are easily obtained via food sources, so supplements tend to go light on both of these. 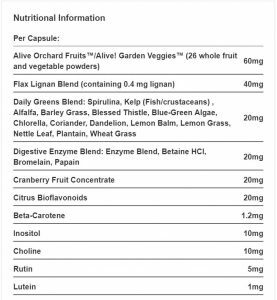 – Orchard Fruits / Garden Veggies Blend, 60mg: the 26 fruit and vegetables present in this blend add a little extra of all the vitamins present in the supplement formula, in their natural form. 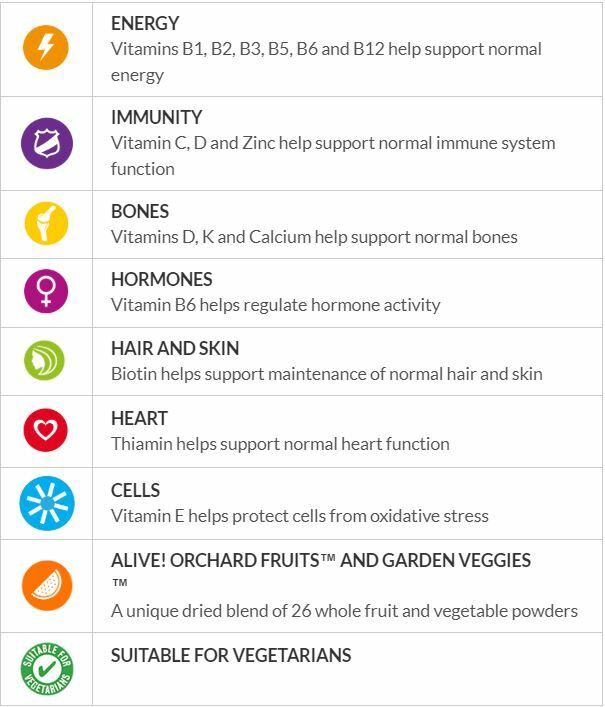 This is a good thing as most vitamins are usually better absorbed in their natural form. – Cranberry, 20mg: promotes the normal function of the urinary tract. – Daily Greens Blend, 20mg: provides high levels of nutrients and amino acids. It includes superfoods such as spirulina, chlorella and alfalfa, among others. – Beta-Carotene, 1.2mg: converted into vitamin A. Too much beta-carotene can be toxic and discolour the skin, but the amount here is under the recommended daily amount (which is between 6 and 15mg). – Citrus bioflavonoids, 20mg: antioxidant, and helps enhance the action of vitamin C. They are directly extracted from citrus fruit. – Digestive Enzyme Blend, 20mg: promotes good digestion daily. – Flax Lignan Blend, 40mg: provides good fats in the form of Omega 3 that promote heart health and supports the normal function of the GI tract. Nature’s Way Alive! Ultra Women’s 50+ Wholefood Plus includes some ingredients that can interact with other medications, such as blood thinners. 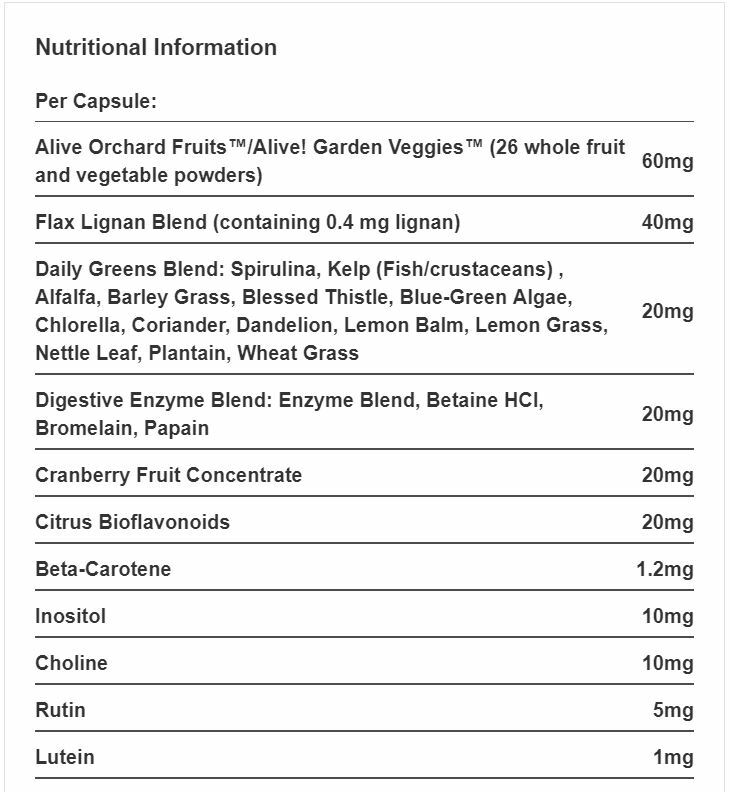 The WholeFoods version of Alive’s women 50+ multivitamin is more expensive than its plain old vitamins and minerals alternative. Approximately £19.99 for 60 Alive! Ultra Women’s 50+ Wholefood Plus as opposed to just over £15 for 60 tablets of its plainer version, at the time of writing. Though it does give us an additional 181.2mg of wholefood ingredients. Some users have reported light nausea and stomach pains. Make sure to take the pill with food as directed to avoid those side effects. Apart from that, Nature’s Way Alive! Ultra Women’s 50+ Wholefood Plus is a safe supplement to use for the general population, though there are health concerns for certain people (see below). However, always refer to your GP if you have a doubt. The ingredients contained in the proprietary blends and derived from Whole Foods can interact with certain medications, such as blood thinners and antidepressants. This is notably the case of vitamin E, vitamin K, and cranberry. If you are currently following a medical treatment, we strongly recommend you talk to your GP before taking Nature’s Way Alive! Ultra Women’s 50+ Wholefood Plus. Take one pill once a day, with food. Some doctors have advised to cut the pill in half and take one half in the morning and one half in the evening in order to better metabolise the vitamins, minerals and whole foods. You do not need to take another multivitamin supplement while taking Nature’s Way Alive! Ultra Women’s 50+ Wholefood Plus. Overall, Nature’s Way Alive! Ultra Women’s 50+ Wholefood Plus does its job pretty well. Users are satisfied and can feel a significant increase in energy, thanks to the whole foods blends contained in the supplement. Nature’s Way Alive! Ultra Women’s 50+ Wholefood Plus is an interesting supplement for older women. Packed with whole foods, it definitely adds a little extra something to the basic multivitamin supplement. It is best suited to women over 50 looking to increase their energy levels while staying healthy. However, the presence of potent whole foods and relatively high doses of vitamin E and K when compared to competitors (such as Nature’s Aid Women 50+) causes it to interact with common medications such as blood thinners. It also opts for some massive doses of certain vitamins (B12, vitamin D) that doesn’t really seem needed. For that reason, we recommend that you always check with your GP if that supplement is safe for you and suited for your needs.